In this white paper, we will discuss possible upgrades for the transfer switch assembly on the Westinghouse UTT Series load tap changer (LTC). These upgrades address areas of the transfer switch that are prone to failure due to overheating and carbon buildup and are applicable to the UTT, UTT-A, UTT-A70 and UTT-B models. Form, fit, and function of these upgrades are of the highest quality available. Each phase of a 3-phase UTT LTC contains two transfer switch assemblies. Figure 1 below contains 3-D models of individual phase panels for each of the different UTT Series LTC models. Red arrows indicate areas where overheating and coking typically occur. These arrows also help visually identify areas where differences exist in the individual model designs. Additionally, the area of the phase panel that includes the transfer switches has been identified in a red rectangle. Figure 2 below depicts the transfer switch portion of a UTT phase panel. 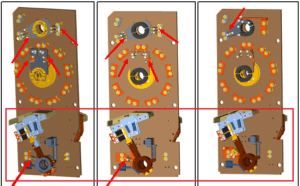 The stationary and moving contact portion of the transfer switch assemblies are circled for ease of identification. You will note that two transfer switch contact assemblies are included for each phase, one on either side of each phase panel. When standing in front of the open inspection door, the front transfer contact assembly on each phase is readily visible on the right hand side of each phase panel and can be easily inspected. The second transfer contact assembly for each phase is more difficult to inspect, as it is in the back of the compartment and is most often obscured from sight by the leads. 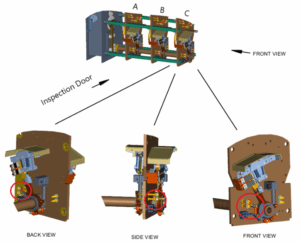 In order to complete a thorough inspection, care must be taken to inspect all six transfer switch contact assemblies.